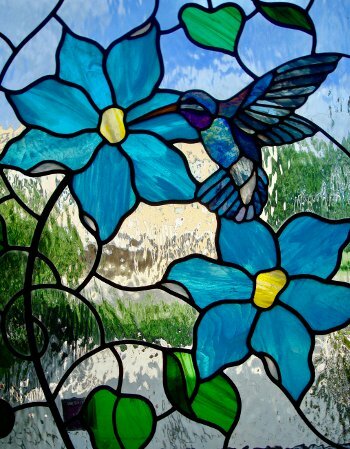 Carved Designs has been creating glass art works in stained glass and etched glass for over 25 years. Our objective is to focus on each client’s needs for various applications in home or office. Glass works include traditional to contemporary designs concentrating on enhancement of style in the space they will occupy. 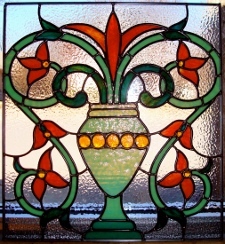 Carved Designs creates custom designs for stained glass, beveled, or etched glass, doors and sidelites. Our unique one-of-a-kind stained glass installations are the perfect addition to your home or office. We will work with you and your vision to measure, plan and install your stained glass art. Carved Designs can create your glass vision! Prepare a rough measurement of the opening and any colors and concepts for the project you may want. If you're not sure what you want, many references are available in the shop. We're happy to help! After consultation the design work begins. At this time a small deposit will be requested, the amount depending on the size of the job. All deposits go towards the final cost of the work. A rendering will be provided for each window and upon approval the colors and textures will be selected from samples in shop. Final measurements are taken and extra installation details are defined if needed. Pre-pay deposit of half the total cost of the project.